The Wool Bed Company (WBC), located at Kerry Hills Farm north of Oconomowoc, Wisconsin (about 30 miles west of Milwaukee), was started by Susan McCourt because of her concerns over toxicity in home products, especially in the bedroom. With extensive research, she designed and patented an all-wool bed made from organic cotton ticking and organic wool. These and other organic wool products are sold online under the Surround Ewe brand. WBC mattresses and toppers are sold through stores in Pennsylvania and Texas. The Wool Bed Company uses ECO-Pure™ wool, sheared from sheep not treated with chemicals on their own farm and on others in the United States. The raw wool is carded by their carding machine at the farm. A video on the WBC website shows this carder at work while a production worker explains the process. 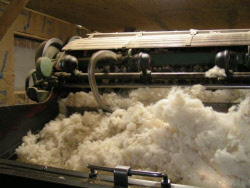 The result is wool batting which can be used in mattresses, toppers and pillows. The Wool Bed Company website has a considerable amount of information on wool, how it is used and the benefits. For instance, one page is titled, Wool Bedding Benefits a Variety of Climates. There are 25 articles listed. Wool has several benefits. The oldest recognized benefit is that wool naturally regulates temperature. It keeps the user warm in Winter and cool in Summer. 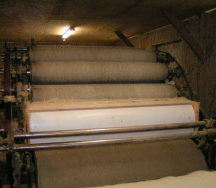 Raw wool still has lanolin, which is a barrier to dust mites. It is breathable, cushioning, and a natural fire retardant. Organic wool has the additional benefit of being non-toxic. First, the sheep are not treated with chemical baths, unnecessary antibiotics, growth hormones, etc. Then the raw wool is not processed with chemicals, such as bleaches. Furthermore, since wool itself is a fire retardant, no toxic chemicals are needed to meet federal flammability standards. Did you know the Wool Bed Company holds a patent on our wool bed sleep system? When we were developing our wool mattresses and organic wool mattress toppers, we did research with patients whose medical conditions – Multiple Sclerosis, fibromyalgia, polio, and severe arthritis – made it very hard for them to sleep comfortably. We experimented with different wool mattress filling techniques and densities until our patients were getting a good night’s rest. Once we had designed an organic wool sleep system that was comfortable for people in constant pain, everyone who tried it out agreed, it was the most comfortable bedding they had ever slept on. Whether you have a medical condition that makes sleeping difficult, or you are just looking for a chemical-free mattress that provides the best possible night’s rest, the Wool Bed Company is the only place to turn. Our patented organic wool mattress and mattress topper are unlike any other organic wool bedding products on the market. The WBC website has a testimonial from Dr. Howard Liebowitz, MD, who is concerned about how toxicity affects people. The two current wool mattresses made and sold by the Wool Bed Company are the 7" Surround Ewe™ Premium (mattress only) and 14" Surround Ewe™ Signature (complete mattress set). Besides pillows, toppers and mattresses, Wool Bed Company also makes wood platform beds (crafted by Amish workers) and pet sleeping pads. Here are the current reviews for beds from "Wool Bed Company"